Cuisinart is one of the most reputed kitchen brands. When it comes to quality, performance output, and design, Cuisinart sets the bar high with the best food processors that are sophisticated as they are operational.Turn something as mundane as pizza dough into a tasty treat with Cuisinart. 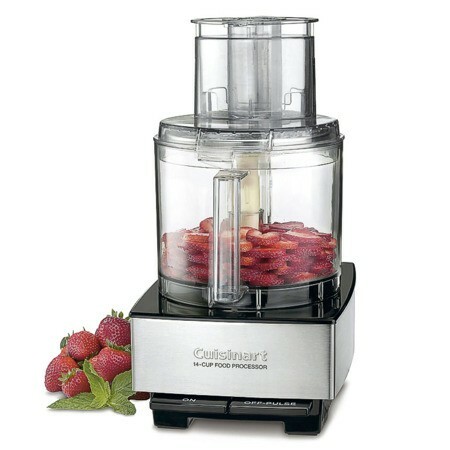 The Cuisinart Food Processor (Model number: DFP-14BC) has an enormous feed tube that holds entire fruits and vegetables. In this cuisinart food processor reviews, we’ll find out why it is best. 4mm stainless steel medium sized slicing disc. Cuisinart Food Processor includes a wooden spoon and recipe book. It usually comes in brushed stainless steel chrome and its dimensions are around 9.3 inches x 16.6 inches x 12.6 inches and weight around 16.8 pounds. This food processor was highly recommended by Americas Test Kitchen. It comes with a 3-year limited warranty and the manufacturer’s warranty can be expressly requested from customer service. The product is built to be accustomed to North American Electrical Standards. The 720-watt capacity food processor has innovative “on” and “off/pulsing” buttons. It has the fundamental seven food preparation options. The only negative side is that replacement parts are costly, so tread carefully. It performs perfectly, but the lid is a bit difficult to latch on properly, which is crucial for it to perform which translates in poor design. This expansive capacity food processor quickens all cooking, from convenient, dinners to weekend fiestas. With the big 14-cup work bowl, extra large feed tube, and dishwasher safe parts, there’s enough time to share the scrumptious meals with loved ones. The 14-cup work bowl is capable of processing enormous quantities of food for family-size meals and entertainment purposes!Heavy-duty 720 watt motor makes an initial preparation of large batches quick and convenient. Extra-Large Feed Tube accommodates entire fruits and vegetables to comfortably fit inside for less processing times and with easiness. The reliable and consistent stainless steel blades easily move through any preparation task, from single garlic cloves to heavy dough. The DFP-14 performs most of the essential cooking functions you need. Control paddles provide a single-touch experience. The safety mechanism is not very easy to clean, and the use of pipe cleaners or chopsticks is not a convenient way to clean them since it’s actually not possible to clean the units with either. There is clearly a design failure regarding the cleaning option of the safety mechanism. Why every kitchen requires a Cuisinart? First the aesthetic appeal, this model is complimentary to most of the other stainless steel appliances, including double oven, toaster, microwave, etc. It looks very sophisticated in comparison to the earlier models. In other words, customers are highly pleased with its appearance. Since older Cuisinart designs were successful for several years, this particular design happens to be hardier and was cheaper than another Cuisinart model with oval buttons that looked less commanding. In spite of a few modifications to the food processor assembly, this new DFP-14BC model is very similar to my older models and is very convenient to use. Even better is the fact that my older DLC-7 parts (with detachable stems) also perfectly fit this new processor. So far, I’ve used the sharp metal blade, which worked very perfectly, and the processing discs that again work conveniently and give extraordinary results. Additionally, this new processor’s motor is more robust than the existing models and one can’t wait to experiment with new cooking. For new food processor users, a demonstration video comes along with this machine and walks you through everything you’ll ever need to know. You would never wish to make a pie crust again without this novel machine! Hope this Cuisinart food processor reviews will be helpful to your buying decision.